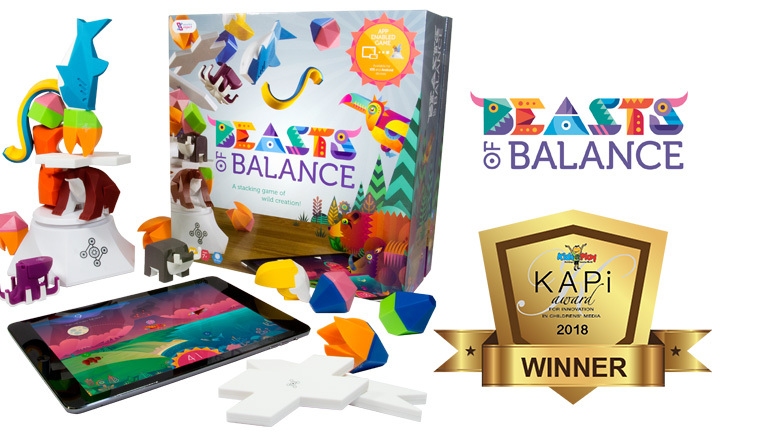 Beasts of Balance is an award-winning augmented reality stacking game of dexterity, strategy and creation. Combining physical tabletop gaming with an innovative digital app, Beasts of Balance uses the latest in tech developments for the ultimate Augmented Reality experience. The goal of the game is to build beautiful towers and care for the creatures you create in the magical connected world in order to achieve new high scores. This unique game is the first from London-based developer Sensible Object, a game studio that explores new territory for games where the latest technology can blend physical and digital into new fun and social experiences and that is now part of the Alexa Accelerator, Powered by Techstars. Beasts of Balance uses RFID technology to recognize the pieces, load sensors to detect whether the tower is standing, and Bluetooth to connect to the player’s iOS or Android powered phone, tablet or TV. Beasts of Balance is available for an affordable $99 from leading retailers such as Amazon, Apple, and Barnes & Noble. Recommended for kids and adults ages 7 to 77! Traditionally a cooperative game, the Beasts of Balance BATTLES expansion is launching in 2018 to bring even more innovation and competitive gameplay.